Mining the social sciences to build online communities. The book describes how society is being shaped by the diffusion and increasing centrality of the Internet in everyday life and work. It introduces students and those interested in the factors shaping the Internet and its impact on society to a core set of readings that address this question in specific social and institutional contexts. that they are unique and others in the group cannot make contributions similar to theirs." The design claim ties a specific design principle (i.e., emphasize the uniqueness of a contribution) to a goal (i.e., increase members' contributions). Design claims also have conditions under which they may apply, such as the demographics, size, and topic of the community. The complete formulation of this type of design claim looks like this: "alternative X helps/hinders achievement of goal Y under conditions Z". Other claims focus on which of different design alternatives will be more successful. Specific ideas on how to implement the various design claims along with the theoretical basis for them are discussed alongside each design claim throughout the book. The framework is excellent, though at times there are so many design claims it can be a bit overwhelming to students. The design claim approach is in the positivist social science tradition (as the authors state in the Introduction chapter). While this has its benefits, it also has its drawbacks. The focus tends to be primarily on the design claims (i.e., hypotheses) and only secondarily on the context in which they appear. In practice there are many design choices that often interact with one another in complex ways, making it hard to predict whether or not a particular design claim will work in any given community. 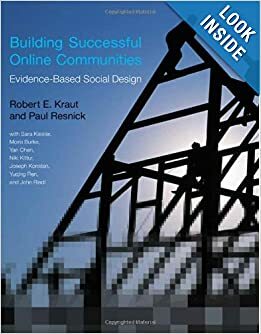 The book does not specifically discuss methods and tools for testing these design claims in the field, though many examples are provided of such tests and the authors clearly have a good understanding of how to conduct online "field experiments" of the sort needed. Complementing this book with a couple of readings on experimental design and A/B testing tools and methods is helpful. Doing so allows community designers to test the design claims they believe are important rather than relying on a theoretical argument that may or may not work in practice. What does social science tell us about how to make thriving online communities? Quite a lot, it turns out—but only if we listen very closely and, at times, employ a translator. Economics and various branches of psychology offer theories of individual motivation and of human behavior in social situations. The theories generalize from observations of naturally occurring behavior, from controlled experiments, and from abstract mathematical models. Properly interpreted, they can inform choices about how to get a community started, integrate newcomers, encourage commitment, regulate behavior when there are conflicts, motivate contributions, and coordinate those contributions to maximize benefits for the community. This book makes it easier for us to hear what social science has to tell us. It amplifies relevant theories and experimental evidence and then translates them into specific claims about the likely impact of particular design choices for online communities. What does social science tell us about how to make thriving online communities? Quite a lot, it turns out. But only if we listen very closely and, at times, employ a translator. Economics and various branches of psychology offer theories of individual motivation and of human behavior in social situations. The theories generalize from observations of naturally occurring behavior, from controlled experiments, and from abstract mathematical models. Properly interpreted, they can inform choices about how to get a community started, integrate newcomers, encourage commitment, regulate behavior when there are conflicts, motivate contributions, and coordinate those contributions to maximize benefits for the community. This book makes it easier for us to hear what social science has to tell us. It amplifies relevant theories and experimental evidence and translates them into specific claims about the likely impact of particular design choices for online communities. New to the digital marketing industry? Read on and learn about white label digital marketing. Find out how sunray Pros can help achieve your clients’ goals!